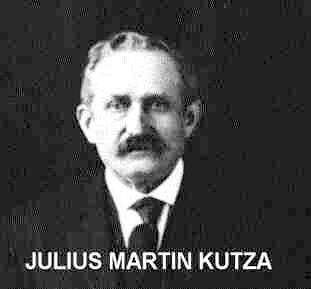 Julius Martin Kutza was born June 8, 1851 in Germany. His father, born in Germany, was Martin Kutza and his mother, whose name is unknown was also born in Germany. 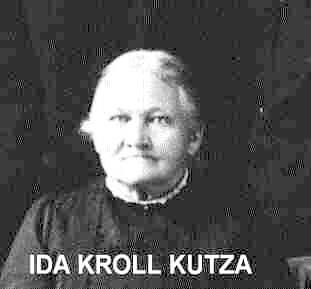 About 1877, while still living in Germany, Julius married Ida C. Kroll, daughter of Christian Gustav Kroll and Christina Schantz. Ida was born in Germany on June 26, 1859. Both of her parents were Germans. The Kutza’s immigrated to the United States in 1887 and settled in Lorain, Ohio. Julius was a ship builder and was one of the first workers to be employed in the American Shipbuilding Company in Lorain. He worked in the shipyard for fifty years, retiring ten years before he died. Of note are other Kutza’s listed in early Lorain, Ohio City Directories. It date, I have no idea who they are. In the 1903 directory there is a listing for Peter Kutza. In the 1905 directory there is a listing for Stephen Kutza and his wife Josie. Julius and Ida raised five children. Three were born in Germany and two in Lorain, Ohio. On the 1900 Ohio Federal Census, the Kutza’s listed that they had eight children, but three were deceased. To date, I have not found the death records of these children. Ida was a charter members of St. John’s Evangelical Church in Lorain, the Ladies Aid Society and Mission Society of the church. German was spoken in the home of Julius and Ida, but they both knew English and used it when out in public. Ida died of hepatitis in Lorain, Ohio on February 19, 1930 at the age of seventy-one. Julius died from a heart attack in Lorain, Ohio two years later on March 19, 1932 at the age of eighty-one. Both are buried in Elmwood Cemetery, Lorain, Ohio. Richard J. Kutza, born January 1878 in Germany, died 1947 in Lorain, Ohio. He married Minnie Hasselman, daughter of William Hasselman, on March 7, 1906. Richard owned Lorain Lumber Company. Both Richard and Minnie are buried in Elmwood Cemetery. They had three children: (1) Karl Kutza born 1908 in Lorain, Ohio (2) Leonard Kutza born June 11, 1909 in Lorain, Ohio and (3) Helen Kutza born 1914 in Lorain, Ohio. AMANDA KUTZA, born October 19, 1879 in Germany, died March 18, 1927 in Axtel, Ohio, married AUGUST C. FARSCHMAN about 1898. Edith Margaret Kutza, born September 18, 1887 in Lorain, Ohio, died February 18, 1942 in Lorain, Ohio, married James R. Bardonner on September 28, 1912. Both Edith and James are buried in Elmwood Cemetery, Lorain, Ohio. They had three sons: (1) Ralph J. Bardonner born September 13, 1914 in Lorain, Ohio died June 27, 1977 in Lorain, Ohio, buried in Elmwood Cemetery; (2) Richard Bardonner born September 11, 1916 in Lorain, Ohio d. 1996; and (3) James L. Bardonner born August 17, 1918 in Lorain, Ohio. William E. Kutza, born March 9, 1893 in Lorain, Ohio, died January 1972 in South Amherst, Ohio, married Theresa Weber. Bill worked at Kutza Pharmacy. Both Bill and Theresa were injured in the 1924 tornado--Bill was knocked unconscious and Theresa received a broken shoulder. She was taken to a Cleveland hospital aboard a large passenger boat. Bill and Theresa are both buried in Calvary Cemetery, Lorain, Ohio. A special thank you to James L. Bardonner, son of James R. and Edith Kutza Bardonner who has shared family photographs, stories, and special memories. Unlock the Kutza Treasure Chest!